I have a list tacked to the wall in the kitchen that says "Things to do before we leave for Morocco". It's really quite long and it seems every time I cross something off I add two more things to the bottom. I did manage however to get some things done. Most of us have gotten our vaccines (except Phoebe who never seems to have any time). Unfortunately Mike and I had to get hep A and B jabs. These vaccines weren't available when we were kids and every night since my arms have been throbbing (though last night was much better). The typhoid we'll be taking some pills for 2 weeks prior to departure. 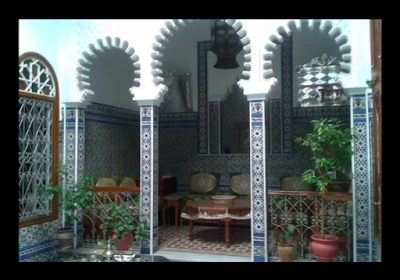 Also I confirmed our "riad" where we're staying in Tétouan (see the gorgeous photo above). Phoebe studies architecture and fell in love with the photos of this place. It's right in the medina so we can go wandering through every day! Anyway I'm trying to cross off a few things each week on my list as we're down to just 5 weeks till we leave! In the meantime Phoenix is doing it's usual warm up. We're hitting temps in the 90's again. Believe it or not it will be cooler in North Africa when we leave than it will be here. Today I have a class to teach about painting surreal images and masks to complete for clients here and abroad. Have a fabulous week!